A summary of today’s show: Fr. Mike Harrington and Lorna DesRoses tell Scot and Fr. Matt about the cultural diversity of Boston (for example, there are 27 different ethnic groups in the archdiocese; the largest Brazilian community outside Brazil is in Boston) as well as the upcoming Catholic Family Festival on June 25. Marian Bain also updates on the latest news from WQOM. 1st segment: Scot welcomes back Fr. Mat, who is returning from Breaux Bridge, Louisiana, where he was visiting a friend who knew from seminary. He entered more deeply into the Cajun experience. On the last night of his trip, they went out to dinner where he tried turtle soup and fried alligator, all of which he thought was very good. Fr. Matt said the final game of the Stanley Cup is tonight and he has a wager with the head of youth ministry in the Archdiocese of Vancouver. Fr. Matt is wagering New England clam chowder and baked beans and they’re offering British Columbia smoked salmon and some Canadian bacon. Cardinal Seán and Archbishop Miller also have a wager. Fr. Matt said his friend’s child was baptized Sunday on the Feast of Pentecost, which couldn’t have been better timing. The night before they went to a Cajun festival with music and dancing. His friend told him about Charlene Richard, who died in 1959 from Leukemia, who is called the Little Cajun saint. She offered all of her suffering for others and was known for being devoted to the Blessed Mother. There have been miracles attributed to prayers said at her tomb. Fr. Matt said they visited the tomb to sing and praise God. As they prayed, a wind kicked up to cool them off the rest of the evening from the 99-degree, 100-percent humidity weather. 2nd segment: Scot welcomes Fr. Mike and Lorna to the show. Scot said the Office of Cultural Diversity is the broadest ministry in the Pastoral Center. Fr. Mike said they do outreach to 27 different ethnic communities throughout the Archdiocese, from very large communities like Brazilians to very small like Japanese and some Middle Eastern. Lorna said Mass is celebrated in more than 25 different languages each Sunday. Fr. Mike started in the office last year and Lorna has worked in the office for 7 years. Scot said there are many ministries in the archdiocese that reach out to people just in English and Fr. Mike’s small staff offers the same services to 27 different communities. Fr. Mike said there are rewards and joys in reaching out to these communities, which are not on the fringe, but are at the heart of the life of the Church in this archdiocese. As an example, he works with 16 different Brazilian communities to connect them to marriage prep, youth and young adult events, conferences, sacramental preparations, Masses in their languages, and other ways. On June 25, the Office is hosting the Catholic Family Festival at Malden Catholic High School from noon to 7pm. It will include a cultural gala involving 14 communities performing and singing. There will be time for families to let their kids play in various games. There will be a procession of nations, Mass with Cardinal Seán, and a international food festival. Fr. Mike said the cultural gala will honor Blessed Pope John Paul II through native song and dance from Brazil, Kenya, Vietnam, and all other parts of the world that the Holy Father went out to visit throughout his pontificate. Lorna points out that the next day is the Feast of Corpus Christi in which we are One Body. Scot said in his parish where he grew up in Lowell, it was mostly French Canadian with a few Irish. He went back a few years ago to a reunion and there’s now an African community which brought new life and amazing music and joy. It’s all very Catholic but different from what he’s used to. Fr. Mike said seeing this vitality in worship is new to him and exciting. Lorna said it’s wonderful to worship with, say, the Kenyan community praying in Swahili. At the food festival, some of the food will include Korean barbecue, Haitian yellow cake, East African chapati bread, Brazilian fish stew, and much more. For those who find it too adventurous, they will also have some hamburgers and hot dogs. 3rd segment: Scot said there is no cost to attend the festival. Fr. Mike said there is a suggested donation of $10 for individual, $20 for families, but it is absolutely free. This is made possible because of Malden Catholic High School’s generosity in donating the facility. This is the first Catholic family festival that is designed to reach out to culturally diverse families. There are many young people in these communities, which makes Fr. Mike particularly excited. Fr. Matt asked Fr. Mike why he has a passion for family festivals. When he first got involved in 2005, the Archdiocese was in a difficult time. At the time he was a state chaplain to the Mass. Knights of Columbus, and he wanted to do something for families. With the Men’s and Women’s Conferences starting at the same time, this was good news building up the Church in Boston. Many people said it was the first time they could go to a Catholic event as a family. Over the years, he’s seen the fruits in people becoming more involved in their parishes. He hopes that ethnic groups will feel a greater part of the Archdiocese. Scot noted that many adults get energized by seeing young Catholics getting involved and having hope in the Church. Fr. Mike said a few years ago they had a relic of St. Paul at the festival and many young people prayed before it. A woman said to Fr. Mike she was very moved to see young people the age of her grandkids praying. There will be a youth festival after the family day and they will ask all youth and the young at heart to stay to pray and sing together. Scot said the cultural diversity will be akin to what Fr. Matt will see at World Youth in Madrid this summer. Fr. Mike said he’s been to five World Youth Days and he’s slept in many fields. Fr. Mike’s been reviewing many videos of John Paul at WYD and seeing the energy and vitality. Part of what he wants to do is bring that energy and vitality to the archdiocese. Fr. Matt asked Fr. Mike and Lorna what’s the recipe for finding all these faith-filled Catholics in these communities. Lorna said there are some commonalities in these various communities. She sees families bringing their children to Mass with them, passing on their faith. The young adults want to be part of their community. Fr. Mike said he sees a real desire to experience the love of God. The importance is presence. Often it took visiting the communities four or five times to really enter into and become part of these communities. The Mass with Cardinal Seán will be in English, but different choirs will sing in difference languages. There will a procession of the nations leading into the Mass, each group carrying an image of the Blessed Mother that is special to each community. A bishop from Uganda will be there. There will be 30-35 priests of various communities present and all priests are welcome. Fr. Mike said they can accommodate more than 1,100 people at the Mass. 4th segment: Scot asked Lorna about some of the larger communities they serve. The largest community is the Brazilian, with 16 parishes where they worship. Vietnamese is another large community with 11 parishes. There are eight parishes with Haitian communities. She said the second language within the Archdiocese is not Spanish, but Portuguese, even though 36 parishes have Spanish Masses. Boston has the largest community of Brazilians outside of Brazil in the world. It is the same for Uganda and Cape Verde. Fr. Mike said communities have emerged here because those of their own community have found work and a welcome in the faith. Fr. Matt asked how many Portuguese-speaking priests we have in the archdiocese. Fr. Mike said there aren’t enough priests who speak the language and they often have priests from Brazil, the Azores, and Portugal to help make up the gap. There are three seminarians who are Brazilian as well. The communities love Cardinal Seán and it’s mutual. He comes alive around them. He speaks seven languages and speaks to many of them in their own language. Some have told Fr. Mike that they owe the life of their community to Cardinal Seán. Lorna said the Haitian Creole community in Boston is the third-largest outside of Haiti (Miami is #1 and New York is #2). They have been present here since the 1970s. The largest community is at St. Angela’s in Mattapan and also at Brockton’s Christ the King. The communities are found throughout the archdiocese. Fr. Mike said he is tremendously excited by these burgeoning communities. Any given Sunday at these communities the churches are packed to overflowing. Every Sunday is like Easter. 5th segment: It’s time to announce the winner of the weekly WQOM Benefactor Raffle. Our prize this week is a copy of the book Saints of the Bible: Exploring Scripture with Holy Men and Women, by Theresa Doyle-Nelson. This inspirational collection of 48 Biblical personalities recognized as saints by the Church includes both the famous and less well-known. Each entry features the saint’s feast day and patronage, a key Scripture, reflection, and additional Scripture verses. This week’s winner is Casey Curtin from Waltham, Mass. Congratulations Casey! Scot welcomes Maria Bain back to the program. She says she’s met many wonderful Catholics in Boston during her various parish presentations throughout the Archdiocese. Scot said many of us hear great responses from listeners about the value of Catholic radio in Boston. Maria said many listeners call the station to ask questions and to thank them. She shared a letter from a listener who thanked the station for changing their lives, bringing her family back to God. 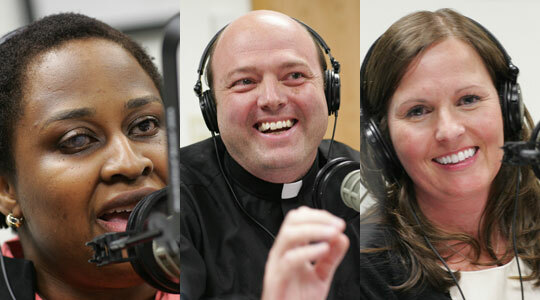 Scot said the voice mail at The Good Catholic Life also receives calls from listeners who want to express their joy at having the show. 617-410-6277. Scot said one of the testimonials we have heard is from Jack Shaughnessy, who has been a very big supporter of the Church’s work in the Archdiocese of Boston. Fr. Matt said we have to be out there making the message of the Gospel heard to give people an opportunity to receive the gift of faith. This is an opportunity to proclaim friendship with Jesus and the joy of faith. Scot asked Maria how the spring fund drive went. The goal was $300,000. Right now they’re still show about $70,000. To donate, go to WQOM.org or contact Maria directly for a pledge or donation. Scot often points out to people that the Archdiocese does not own WQOM nor does it fund the station. The Station of the Cross is a private ministry based in upstate New York that took the risk to start a station in Boston at Cardinal Seán’s invitation. They are 100% donor funded. Maria has been traveling all over the Archdiocese to present at parishes. She thanks everyone who has welcomed WQOM. If a listener wants her to present at their parish, please give her a call. She relies on the invitation of the pastor, so a parishioner would work with the pastor to bring Maria to the parish. Maria said the station is also looking for the donation of about 1,200 square feet of office space a little closer to Boston than their current location in Framingham. Anyone who has a lead on some space, should contact Maria.